of Sir Walter Raliegh Street and Queen Elizabeth Avenue, on the left when traveling east on Sir Walter Raliegh Street. Touch for map. 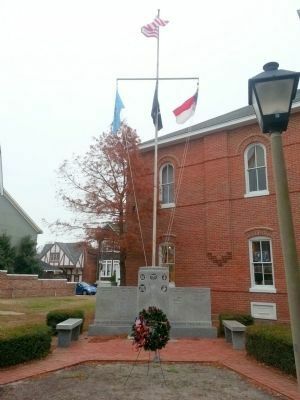 Marker is in this post office area: Manteo NC 27954, United States of America. Touch for directions. 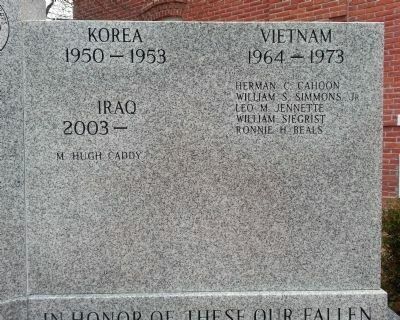 Other nearby markers. At least 8 other markers are within 2 miles of this marker, measured as the crow flies. USLSS/USCG Station Pea Island Memorial (about 400 feet away, measured in a direct line); Manteo Weather Tower (about 500 feet away); Roanoke Marshes Lighthouse (about 500 feet away); Spirit of Roanoke Island (about 500 feet away); Confederate Channel Obstructions (approx. 0.4 miles away); Fort Bartow (approx. 0.4 miles away); Andrew Cartwright (approx. 1.4 miles away); Battle of Roanoke Island (approx. 1½ miles away). Touch for a list and map of all markers in Manteo. More. 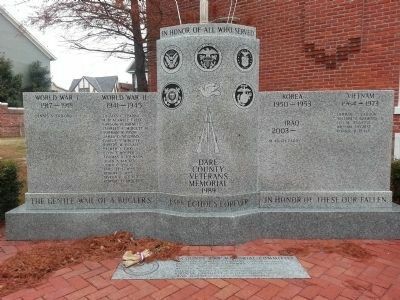 Search the internet for Dare County Veterans Memorial. Credits. This page was last revised on June 16, 2016. 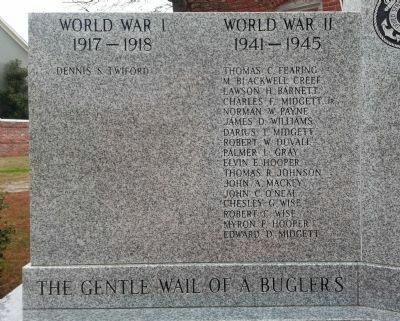 This page originally submitted on December 21, 2014, by Bernard Fisher of Mechanicsville, Virginia. This page has been viewed 333 times since then and 7 times this year. Photos: 1, 2, 3, 4. submitted on December 21, 2014, by Bernard Fisher of Mechanicsville, Virginia.